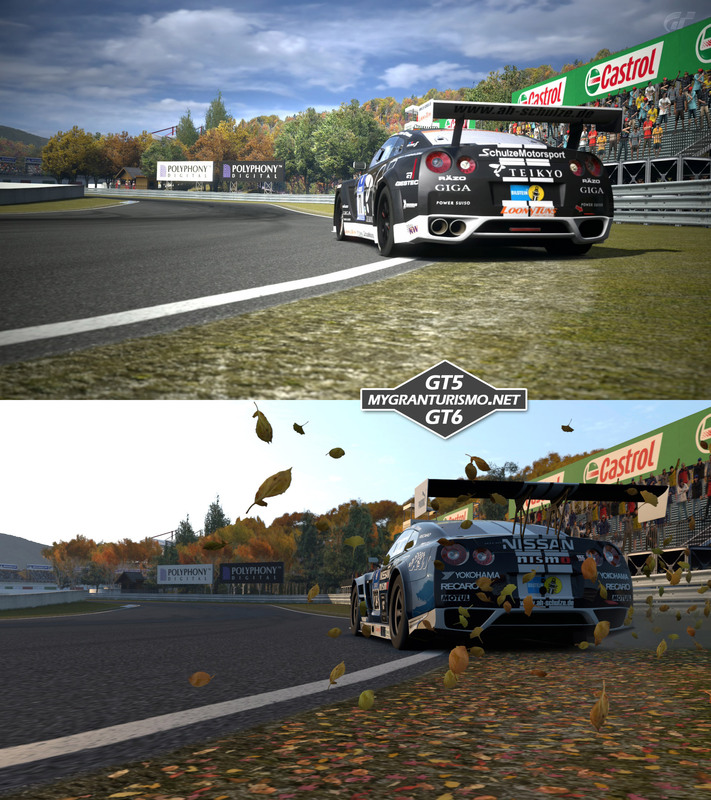 We shoot GT5 images in photo-mode (on playable track, but the image is still better than during actual playing), which has obviously been used by PD for the GT6 images. Everybody can draw its own conclusion. Click on a group of images to zoom (the window will have a "more zoom" option). On this first comparison, the difference at first glance is clear on a detail (the flying leafs). But this has more to do with the change on the track side than with engine differences, as similar flying object occurs in GT5 in other places. 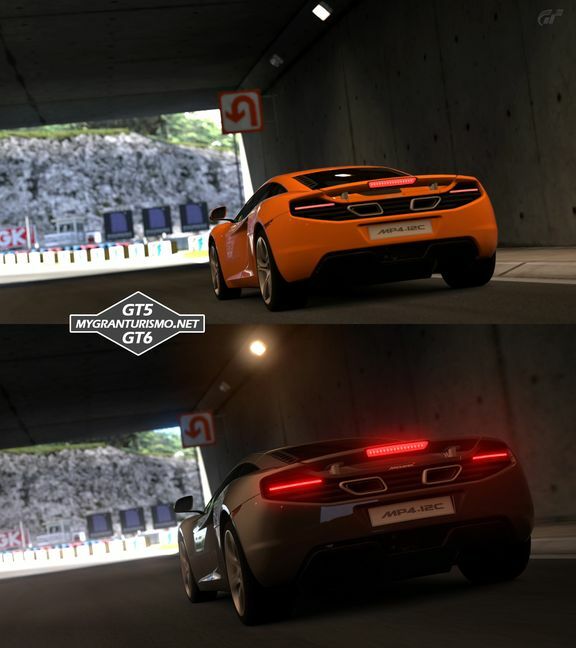 On this second comparison, we can see a difference in the GT6 lights, and even the overall lighting. We were unable to match this effect with settings in GT5. Also, the Mc Laren logo is way more detailed... but its a detail, indeed. While graphically, there isn't too much of a change, it would be difficult to squeeze much more in terms of graphical prowess on the PS3. You site the poor textures, but high quality textures are really expensive (memory and loading times). Besides, I don't think there is much need for now for GT to change graphically... It already looks phenomenal, so I'd rather they spend their time elsewhere. The change on the physics side should be very welcome as right now GT5 holds a simcade kind of feel to it. Sure, there was a big difference between Spec 1 and Spec 2, but the rumors make it sound like a complete overhaul in many aspects which should be great. Honestly, I'm not too impressed so far. GT6 appears to be shaping up to little more than GT5 with some changes that patches could do. And even though I understand the business behind it, I still think that they should make an effort to at least TRY to look substantially different. That first picture offers nothing inherently new, and we should all take a good look at the crowd, which is still 2D and heavily pixilated. Also, the GT-R appears to have no graphical update whatsoever. Even the leaves on the track look half-assed and PS2-quality.The second picture makes things even worse. Lighting has obviusly improved (which is always a good thing), but just look at the walls of that tunnel. Still the same old low-quality textures we've been getting since Gran Turismo 3. And, honestly, if you put either of those pictures side by side and blindly asked me which one was GT5 and which was GT6 I'd be completely unable to answer. All that being said, I'll still pre-order GT6 like a good little lemming, and I'll still probably camp out overnight at Gamestop and shell out hundreds of dollars for this game. Don't get me wrong, I am VERY exited for GT6. Just...it's already shaping up to be a dissapointment.